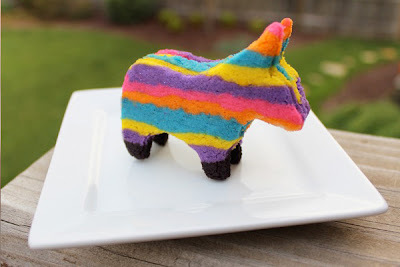 An American Housewife: Donkey Cookie Cutters Are a Must Have for These Pinata Cookies! Donkey Cookie Cutters Are a Must Have for These Pinata Cookies! 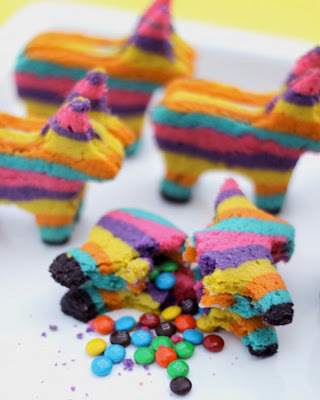 This morning I was browsing the SheKnows site and saw the awesome Pinata Cookies that are trending right now. Although I don't plan on hosting a Cinco de Mayo party this year, I love this idea and had a moment of 'why didn't I ever think of this!?'. I wanted to save the idea to my files to make perhaps next year after we after we know some people here in the new city/state that we have relocated to. 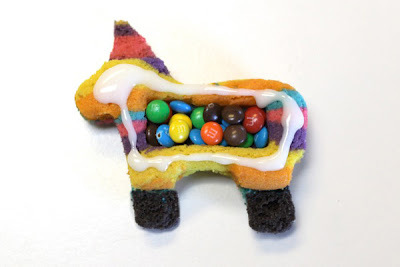 If you by chance haven't seen the M&M stuffed cookies (although they are ALL over the internet right now so you'd have to try pretty hard not to, LOL) they are a multi-colored sugar cookie with a second for the back side and sandwiched inbetween them is a third cookie with the ears and feet cut off and used to hide the goodies inside. They are available on Amazon: Donkey Cookie Cutter .